With the growth of the Internet and the ease of publishing content, more and more creative minds are coming online to share videos, music, software, products, services, opinions, and more. While the technology has empowered a generation to build new audiences and share interesting things, an unfortunate side-effect has been a culture in which some consumers of this content have provided feedback in a form that is personalized, mean-spirited, disrespectful, and in some cases, malicious. We have all seen it…the trolls, the haters, the comment boxes filled with venom and vitriol, typically pointed at people just trying to do good and interesting things. Unfortunately, this conduct can be jarring for many people, with some going as far to give up sharing their creative endeavours so as not to deal with the “wrath of the Internet”. As some of you will know, this has been bothering me for a while now. While there is no silver bullet for solving these issues, one thing I have learned over the years is how to put negative, anti-social, and non-constructive comments and feedback into perspective. To help others with this I have written a free book called Dealing With Disrespect. 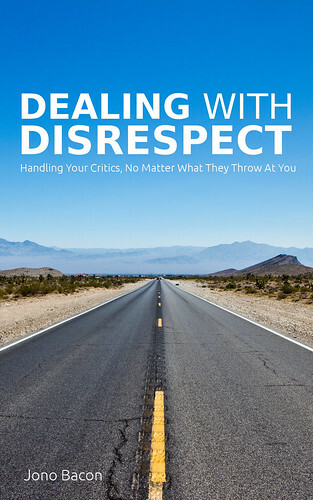 Dealing With Disrespect is a short, simple to read, free book that provides a straight-forward guide for handling this kind of challenging feedback, picking out the legitimate criticism to learn from, and how to not just ignore the haters, but how to manage them. The book helps put all communication, whether on or offline, into perspective and helps you to become a better communicator yourself. My goal with the book is that when someone reads something anti-social that demotivates them, a friend can recommend ‘Dealing With Disrespect’ as something that can help put things in perspective. Go and check out the new website, watch the introductory video, and go and grab the PDF, read it online, or get it for your Kindle. There is also a FAQ. The book is licensed under a Creative Commons license, and I encourage everyone who enjoys it and finds it useful to share it. Ironically, starting a book by gushing about how wonderful your wife and kids are is one of the best ways to provoke negative comments! Is there something wrong with being proud of your family? Nope. And its generally accepted practice to use dedication and acknowledgement sections to be a bit gushy if you have a proclivity for that sort of thing. Seriously writing a book giving out protips on dealing with disrespect when you have in the past used your blog to bash people? When have I used my blog to bash people? That wasn’t bashing, that was disagreeing with him. 99% of that blog post provides respectful rebuttal of his views. The only part that I regret was where I called him ‘childish’, and then I frankly, and honest apologized. As I say in the book, people make mistakes, but when we do, it is important that we honestly and sincerely apologize. This is exactly what I did. Hi Jono! I have a silly question just to make sure and learn more: does Creative Commons License allow me to translate and freely share the product (referring the part “build on it”) – specifically your book? I’ve not finished it yet, but the subject is a matter of concern these days as you mentioned on the book. As I’ve seen your works before I think it should be valuable. By the way, the FAQ link here looks corrupted. Jono, Thanks for sharing your experiences, this was a good read. I have recommended it a few of my friends who are in people facing positions at work. I like the changes with the products at Canonical, realize that a whole lot of thought goes into every decision and it’s not done on a whim. Thanks for the work you do! Hi Jono! Great book, thanks for writing it and publishing it under a CC license, I really enjoyed reading it. If you ever do a 2nd edition, I suggest you add differences in mother tongue under the “Cultural Influences” paragraph: I’ve seen countless misunderstandings that bog down to senders using a language that was not their first language and accidentally phrasing their communication such that it conveyed the wrong tone to native speakers or simply made it very difficult to understand. Thanks a lot for your insights on communication. Taught me a great deal, how to abstract and extract different aspects of communication in general! Since I’m facing difficulties in my little musicians-community right now, this helped me a lot to sort things out, from friendly criticism to attack. Big thanks!! !